Home Cycling The Euskadi Foundation of Landa gives "a step forward"
The Euskadi Foundation of Landa gives "a step forward"
The team that chairs the Movistar cyclist was presented with the novelty of a women's team. 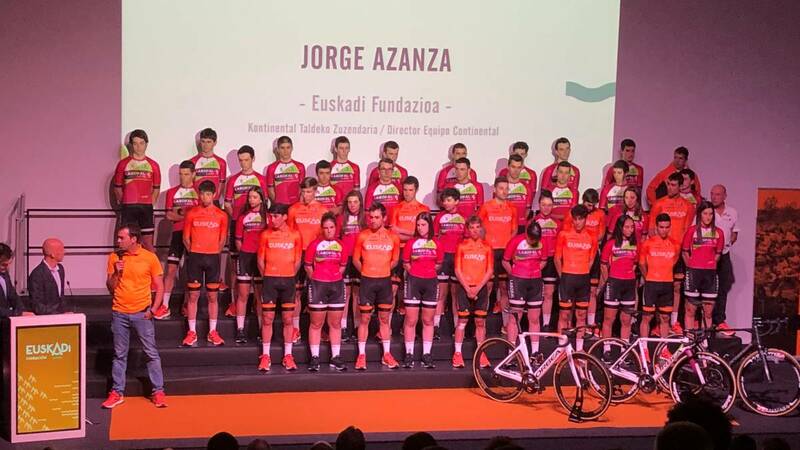 The headquarters of the Orona de Hernani Foundation (Gipuzkoa) hosted the presentation ceremony of the Euskadi Foundation, chaired by the Alava cyclist Mikel Landa. It was the start of the continental team, the women's section and the amateur group. "We are very happy because this year we have taken a step forward. We are growing little by little. It has been a year since I decided to link up again with the Euskadi Foundation, , becoming the new president. It was an unforgettable and exciting moment. The dream of turning the Basque Country into the best territory of cycling is totally stoked, "said Mikel Landa. The Euskadi Foundation will be made up of more than 300 young cyclists in 2019 including boys and girls of children's categories, cadets and juveniles with which agreements have been closed. The continental team will work under the direction of Jorge Azanza and will start in the Challenge of Mallorca. It will be composed by Diego López, Sergio Higuita (loaned six months by Education First), Mikel Alonso, Martin Gotzon, Peio Goikoetxea (already recovered from his kidney removal), Txomin Juaristi, Ibai Azurmendi, Dmitry Zhigunov (Belarusian from Lizarte), Jokin Aranburu, Antonio Jesus Soto and Unai Cuadrado. The first experience of women's category will be directed by Ángel Urreta and will have a roster of ten runners : Ainara Sanz, Isabel García, Paula Suárez, Elena Cuenca, Miriam Gardachal, Paula Lanz, Nahia Eraña, Uxue Albizua, Jone Otaola and Zuriñe Otaola. The Euskaldun, the Spanish Cup and the rest of the national calendar will be part of their competition plan. Finally Mikel Gaztañaga will take over the Laboral Kutxa sub-23. Barandiarán, Sukia, Garmendia, Arakama, Urra, Berasategui, Murua, Lasa, Alvárez, Iribar, Azparren, Amonarriz, Murgiondo, Etxeberria, Latorre, Paredes, Sotil, Ballarin, Aramendia and Edu Santas will be its components. The latter suffers paralysis on his right side and is paralympic with a long track record. The project is based on several supports outside Orona: Orbea, Etxeondo and Laboral Kutxa among others. The event was presented by Xabier Usabiaga and Juan Mari Guajardo and attended by about 200 people. At a political level, the presence of Andoni Egibar, president of the PNV in Gipuzkoa, stood out. Also attended the historic orange leader Miguel Madariaga.